Steve G. Jones, Ed.D., Clinical Hypnotherapist, charges $1,500 for a custom recording and $25,000 for a one-hour private hypnotherapy session at his office. But you can get all the benefits for this low price. Simply listen to the Stop Snoring Hypnosis MP3 every night as you go to bed for three weeks and feel the changes happening in your life. You will feel more empowered, more in touch with your true self, and you will truly know that your goals are within your reach. Steve G. Jones achieves AMAZING and LASTING results!!! Hypnosis is the easiest way to affect change in your life because the positive messages go straight to your subconscious mind effortlessly so you can accomplish your goals and reach for the stars!! All you have to do is listen to the Stop Snoring Hypnosis MP3 download at night as you go to sleep!!! You’ll hear soft music, the gentle sounds of the beach, and the soothing sound of Steve G. Jones’ voice all working together to bring about positive changes in your life easily and naturally. Steve G. Jones has been helping people improve their lives with hypnosis for over 17 years…now it’s time for him to help YOU… don’t wait, do it NOW !!! you’ll be glad you did. See you at the top! If you or someone in your house snores, then you know that it can be disruptive to your sleep. Getting snoring under control is important for two reasons. One reason is that your snoring could be a symptom of something else such as being overweight. The second reason to get your snoring under control is to sleep better. Sleeping is extremely important to our body’s ability to function properly. There are a couple of lifestyle changes that you can make in order to help your snoring. If you are overweight, it is important to eat right and lose weight to try to get down to a healthier weight. If weight is not an issue, you might want to try sleeping on your side or stomach. I encourage to find relief from snoring. It will help you and others in your household get a better nights sleep. And as you continue relaxing deeper, deeper, and more deeply relaxed, you realize just how peaceful you are in all areas of your life. You realize just how dedicated you are to improving your life and now you have chosen to let go of snoring. You have chosen to stop snoring and this is a wonderful idea for yourself and others. And so in order to accomplish this goal, you have decided to take several very powerful steps. If you are overweight you will begin an appropriate exercise program which will allow you to lose weight. Sometimes snoring is caused by being overweight so you have decided to keep your weight in line by eating appropriate foods and exercising, allowing yourself to lose weight and to maintain an appropriate weight for your height. You follow a healthy lifestyle to develop good muscle tone and to lose weight. And this helps you eliminate snoring. Also, you cut back or eliminate alcohol. You realize that drinking can cause snoring so if you drink at night you cut back or eliminate this activity. This also helps eliminate your snoring and you choose to follow a regular sleeping pattern, sleeping at a regular time every night, waking up at a regular time if this is possible with your life pattern. Your sleeping pattern is an important part of your life pattern. And so if it is possible to keep it consistent, then you do so. You choose to sleep on your front or your side instead of your back and this also helps in eliminating snoring. By using all of these habits consistently you will find that you are able to eliminate snoring. If your snoring persists after taking the steps, you of course seek further assistance from a medical professional. 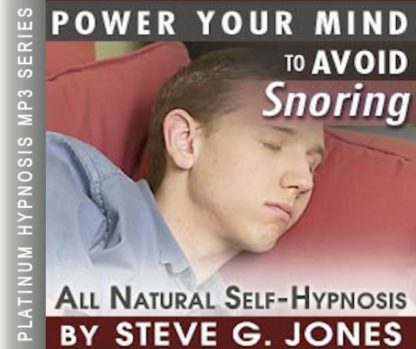 You are so relaxed now realizing that your subconscious mind is being programmed to take the steps necessary to eliminate snoring from your life. You are so very proud of yourself for taking these steps and these steps are programmed into your subconscious mind. You don’t have to think about them before you fall asleep, they become part of your life as a natural result of listening to this recording. Once again, if you are overweight, you choose to lose weight. You choose to live a healthy lifestyle, to develop good muscle tone and to lose weight. You avoid alcohol near bedtime or you cut back on alcohol because drinking can cause snoring. You follow a regular sleep pattern if it is possible. You chose to sleep on your side or on your front rather than on your back. This will also help stop snoring and once you have used all these techniques if you need further assistance you seek the help from a medical professional because you are determined to stop snoring. Congratulations on this powerful decision to help not only yourself, but those who are in your life. Everyone is on your side to help you stop snoring. You are more dedicated than ever to stop snoring. Following these simple guidelines will help you eliminate snoring from your life permanently. So relax, relax and realize that everything is going to be just fine. Snoring is more than just a nuisance for you and your partner. There are serious health risks resulting from snoring. For example, sleep apnea can interfere with your sleep and your health in a major way. People with a chronic snoring condition or more likely to develop sleep apnea. If you or a loved ones snores, we want to encourage you to seek help. 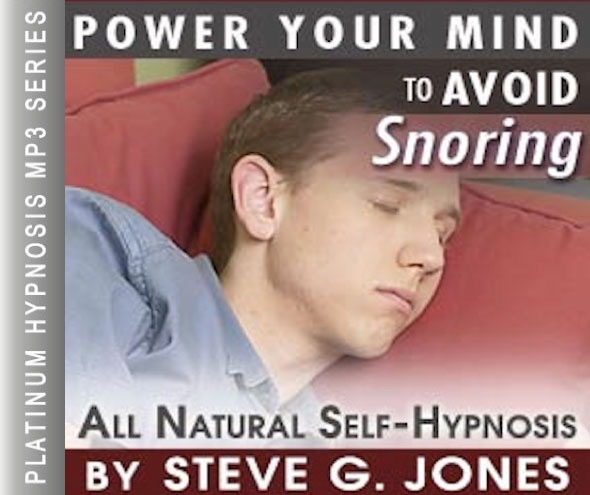 You can get rid of snoring once and for all with hypnotherapy. With hypnosis, stop snoring is easy and natural. We encourage you to listen to this Stop Snoring Hypnosis MP3 program for 21 nights in a row before going to bed. You will begin to see changes as soon as the first night!